Emma Palmer is based in Bristol, England. She is an author, psychotherapist and eco-psychologist. I nominate her on the basis of the massive contributions she has made and continues to make to the world at large, and specifically to the childfree arena. 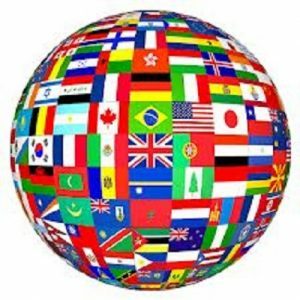 It follows a carefully considered decision to live without having children, a private decision but with truly global consequences. 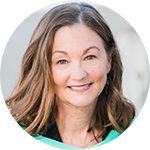 In her eco-psychology work she kindly, tenaciously supports people to recognise that they are an indivisible part of nature, rather than separate from it, through writing, public talks, trainings, workshops and one-on-one therapeutic work. Her vision of life springs from deep ecology, reflecting deeply on having children on a planet which is already overpopulated and consuming way beyond sustainable carbon footprints, and into a world facing catastrophic climate change, extinctions and wealth inequality. In 2016, Earth Books published her second book (under her previous name, Kamalamani), Other than Mother: Choosing Childlessness with Life in Mind, which explores the parenthood decision. It is heartfelt, powerful and honest. It was nominated for Best Book in the 2016 Population Institute’s Global Media Awards. What I love about Emma is her unswerving commitment to opening up spaces for dialogue about this and many other subjects. Although she’s personally chosen to remain childfree after always imagining she would be a mother, she’s interested in people coming to their own conclusions through being fully informed. There is no judgment of others, only a steadfast embodiment of her values through her life’s work and own decisions. 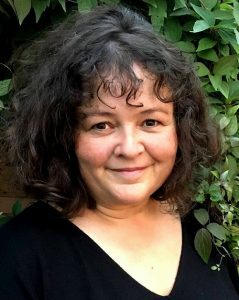 Following the publication of her book, Emma set about building bridges between the childless and consciously childfree through running workshops for those who are without child by choice, circumstance, happenstance or loss. Beyond circumstance, Emma sees that these groups are a minority, much stereotyped at that, given how pronatal our cultures still are. I want to celebrate Emma’s approach to living and the fullness with which she lives life. If she sees that something needs to happen, she’ll wholeheartedly initiate it, drawing people in with enthusiasm and single-mindedness. Emma has a sincere and authentic heart, qualities that are expressed in the name “Sekishindo” that she was given when recently formalising her zen practice, receiving the precepts from me as her teacher. Her connection to the whole of life, seeing the entire universe as her child, comes from the still sitting of our core practice of zazen meditation, as well as from total engagement in appropriate actions. From her zen practice she brings a profound “parental mind” of love and nurture to all her ecological and therapeutic work. I can vouch for her consistent, embodied deep love of life in all its forms. She has transmuted her love for children into something extraordinarily universal, and stands as a positive exemplar and role model for how to direct energies differently. 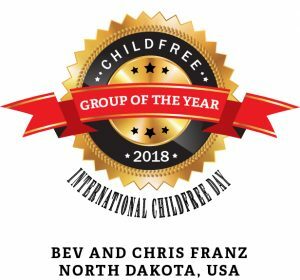 Bev and Chris Franz, who live in Bismark, North Dakota, USA and host the Married Without Children podcast, are the best candidates for Childfree Group of the Year because of their honesty. In their podcast, regular listeners have heard them navigate their journey from, “Hey… I don’t have to have kids!” to their current stage of sharing other people’s thoughts and other issues facing childfree people in our society both locally and globally. Giving a voice to their listeners is their greatest achievement. In their podcast, they share their listener emails (or what they can with permission), and they allow people to have their thoughts and issues brought to the forefront. They help their listeners know that they aren’t alone, that there are many different flavors of childfree and that it’s OK to be how they are. I believe that they give a voice not only to the staunchly childfree, but to the fence-sitters, to the ones who hadn’t given it hard thought yet, and even to those who have or feel they may change their mind. Their recent episode on birth control was an honest discussion of what people’s options are, and they shared a lot of knowledge that some people may not know or have access to. In this episode alone, they have given a wonderful gift to our community. They truly love to share knowledge and help to empower people through it. As they share the process of “coming out” to their families, I know they are helping others to find the courage to do so also. The way they’ve introduced their childfree decision to their loved ones has been slow and gentle, in a loving and understanding way. Their love for their families always shows through their frustration with certain situations, which is something some childfree people struggle with. 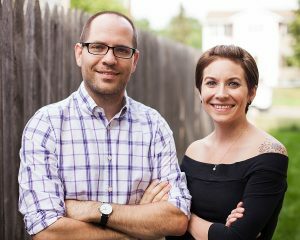 In a publicly available medium such as a podcast, Bev and Chris open the door to non-childfree people to discover them. The thoughtful way that they present their ideas and share the ideas of their listeners will help anyone who comes across the podcast to think twice before they make snap judgments about the childfree lifestyle. 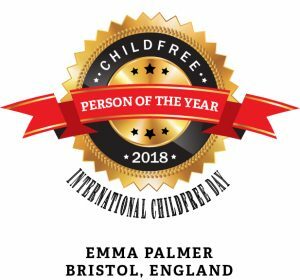 Many thanks to all of the stellar nominees, those who nominated them, and all who have been part of and celebrate International Childfree Day, an annual, formal recognition of amazing childfree people and their lives!